Did you leave your iPhone at work place or someone has intentionally removed it from your pocket? Don’t worry, there is an app called find my iPhone app which will solve all your problems. It's actually a heartbreaking moment when you get to know that your iPhone has lost or stolen. But, thanks to the Apple company who has come up with this superb app. On the other hand, it is very easy to know that how to use find my iPhone app. This app is very easy to use and it will help you to locate your iPhone at the earliest. Therefore, with my iPhone set up on your device you can locate your device, play a sound on it, use the lost mode to lock your device and can easily erase all the information in it. Like many other features in iPhone, find my iPhone use icloud to store and sync data. Therefore, if you are in a situation where you are thinking where is my iPhone then first and the basic thing you need for this is a icloud account. Further, there are chances that you already have one when you first time set up your phone. For this, you can go and check in settings in which you will get to see your account name listed. Always remember that find my iPhone uses Apple email ID to links various devices with your account. The first and basic step to use this app is to check the every requirement required to download this app on your device. Although it is available on all the devices equipped with iPhone or all new versions. But a valid iCloud account is also required for its download and devices which face network issues must be connected to the registered Wi fi network. You might be wondering that how to use find my iPhone app and how to actually start with it? For this, first you need to set up your device and after that you can use this app from any computer using cloud website or you can also download and use its free version available on your device. If you are using this app from a computer, always keep in mind that your browser is recommended in the Apple support system. Once you are done with the installation process of this app just click the settings option. Now enter your Apple ID in the pop up appeared on your window and follow the instructions. After this just swipe to the bottom of the menu once you are signed in, select the find my phone option and activate it by clicking the allowing option in the pop up window. Now, you will not say where is my iPhone if in any case, it's lost as you are safe with this app. This app is something more than just finding or tracking your iPhone. It has a feature which also enables activation lock which secures your Apple ID and automatically links with your device. This feature also requires your password to be entered before anyone can turn off or reactivate your device. After everything is done, you can check and locate your device. If it is lost, you can either use any other iOS device or your cloud account to locate your stolen or lost device. On the other hand, you have to always keep in mind that you will not be able to locate the device if this app is not activated on your device. So, don’t wait and activate this superb app before your phone is lost. Further, if family sharing feature is enabled and everyone shares their locations on the device, you will be able to track all devices from just one account or device. Therefore, the above is the detailed explanation on how to use find my iPhone app 2016 without any hassle. With these simple steps anyone can easily download and start using this app in less than 15 minutes. So this was all about how to use find my iPhone app 2016. I hope you found this tutorial helpful and worth reading. Now no need to worry and look here and there for you iPhone and no need to ask others about where is my iPhone. 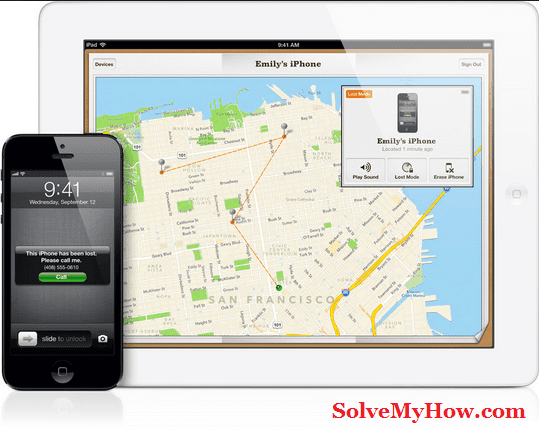 Simply use above methods to find your iPhone easily. Which method you like the most or which method you use to find your iPhone ? do let us know in the comments below. You can also subscribe for SolveMyHow newsletter to get latest updates about iPhone and iOS high quality tutorials right into your inbox. Meme is an expert tour guiding and regularly share her trips experience online on her blog and social network. She recently joined Essay Writing Service as a freelance content marketing expert and share their stories online to get a quick social buzz.